President of the FCI Standards Commission. Co-editor in Chief of the Swedish Kennel Club Gazette for 30 years. Adviser in standard and cynology matters with the Swedish KC for 30 years. Contributions regarding health matters in purebred dogs versus standards/judging since the first Sw. KC conference in 1997. FCI All breed judge for many decades and breeder, exhibitor of many hundreds of Champions. A journalist by profession, Renée was first licensed to judge in 1977. 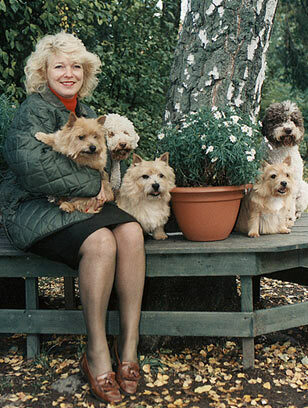 Over the years her breeds have been Norwich Terriers, Lagotto Romagnolo, Pugs, & Pekingese. Fluent in English, French & German, she has judged throughout the Nordic countries, the USA and Western Europe. The author and/or editor of several books on dog breeds, as well as Dog Encyclopaedias in both Swedish and English. Is the sole author on all matters concerning dog breeds in the Swedish National Encyclopaedia. Is responsible for, and initiator and designer of the SKC Museum and the SKC Library. Research into the F.C.I breeds of pure bred dogs, the history and the standards, have been a main issue in the work of Renée Sporre-Willes during the last 25 years. Up to Jan 2009, 258 Champions and 67 Best in Group Winners were bred and/or owned by Renée.